The packaging for "Outsold" looks a bit amateurish, but the music contained is far from amateur thrash metal. These guys wear their influences proudly on their sleeves, with the music falling somewhere between "Reign in Blood", "Ride the Lightning" and the progressive feel of "And Justice for All." Biting thrash metal riffing drives each song. After a rather lengthy intro in "Strife", the song kicks into overdrive with some speed, but soon after breaks into a more mid-paced groove. The song is heavy as a loaded freight-train coming at you at full speed. The early Metallica influences are quite apparent in this song, with even the vocals having a gravely Hatfield vibe. That is not to say this band is a clone. 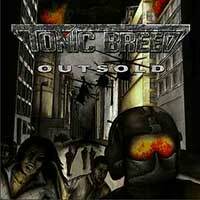 No one would confuse Tonic Breed for Metallica, but the influence is there. Though this song is over six minutes long, it's actually the shortest song on the album if you subtract out the nearly two minutes of keyboard introduction in the song. Most of songs on "Outsold" clock in at over six-minutes in length. In fact, two songs clock in at over seven-minutes and "Borregaard" at over eight-minutes. "Fifth Estate" continues the Slayer-influenced riffing along with the progressive tendencies of "Justice for All". Fortunately Tonic Breed are a New Wave of Thrash Metal band that isn't afraid to move away from the "speed-for-speed-sake" sound. While they do have some very fast parts in their songs, the tempos and time changes keep the songs from getting boring or just becoming or overly repetitive. The title track is a more mid-paced number that chugs along like a steam locomotive. "Bad Company" is another slow, chugging song that still retains all the heaviness and attitude of the first couple tracks. The song almost has a doom-like quality at times and features a killer guitar solo in the mid-section. "Blackened Mind" opens with some nice guitar solo work laid on-top some haunting clean guitars. The songs opening recalling some of the Bay Areas finest; Testament and Forbidden. This song is a ballad of sorts, ebbing and flowing from the dark balladry of the verses to the up-tempo, heavy chorus and the mid-paced chugging bridge and guitar solo section. That album closes with "There's Just One Escape", This song starts off with some 80's style guitar licks that includes some tap-on soloing which gives way to yet another up-tempo thrash metal riff-fest. Overall, Tonic Breed aren't doing anything new, and that's not a bad thing. No one questions a blues artists integrity when he plays well worn blues music. Likewise, Tonic Breed are not trying to break down any new door. The are playing intelligent, riff-oriented power thrash, and doing it well. "Outsold" is one fine thrash metal album. Recommended for those who like real heavy metal.